﻿Since the day that Rin drank the blood of the Great Demon Shehomachi, she has been feeling in perfect health and strength. Rin is very grateful to her husband, Lord Sesshomaru for saving and preserving her life; She now feels that she will be able to spend a long, happy life with her beautiful family. Some time passes and it is time for Rin and Zephra to get the weapons forged from demon bones,fangs and claws from Lady Sango. When Rin and Zephra arrive at the human village, Sango's two daughters are very happy to see Zephra, they look up to her and admire the way she carries herself. Zephra and Rin are happy with the weapons that have been created, there are four weapons, two for each girl and they will be very useful on nights when the girls are in their human state.. The first is called a Kijin, it is forged from the bones of a powerful demon, it is round and has been sharpened to perfection. The weapon can be used like a frisby to be thrown at the enemy. It is sharp enough to slice or maim and will return to the person who tossed it after rounding a perfect U turn. Due to the sharpness of the blade, Sango advises that whomever will be handling this weapon, will do well to wear thick gloves to avoid cutting themselves. The other weapon is called a Boruchen which is a ball and chain weapon, the ball created and smoothed from multiple demon fangs can be used to knock down a foe, being forged from demon fangs it has the power to penetrate straight through the body of an enemy when used with enough force. Attached to the ball is a handle and a long chain that can contract or extend with ease, used for binding. The third weapon is a pair of ninja sias and finally the fourth is a hand weilding weapon with four sharp blades on it. Because these weapons are made from demon parts, they carry a mass of demonic energy and hold great power for bringing down other demons. After looking over the weapons and discussing their abilities, Rin and Sango enter inside the hut to talk a bit and have a cup of tea while Zephra and the twin girls continue to look over the weapons. The girls inquire with Zephra as to why she would need to have demon slayer weapons with her being so powerful, Zephra informs them that she turns into a full human on a certain night every so often and at that time she becomes the same as they are; she also tells them that most half demons go into hiding when they are in human state however she and her sister Nephra will never hide out from enemies or cowar in fear but instead stand brave and prideful using their fighting skills along with these weapons to bring down their enemies during times of vulnerability. 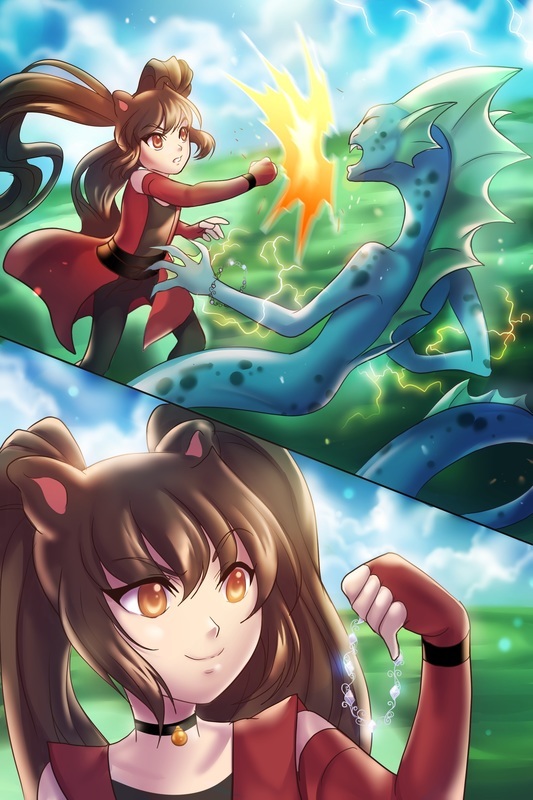 Sango's daughters are so impressed with Zephra's fearless and powerful attitude that she possesses with or without her demon powers, that they look to mimick it and decide when they come of age they want to follow her in her endeavors. From inside the hut Zephra can hear Rin calling for her and she tells Sango's girls that she will return in a moment. 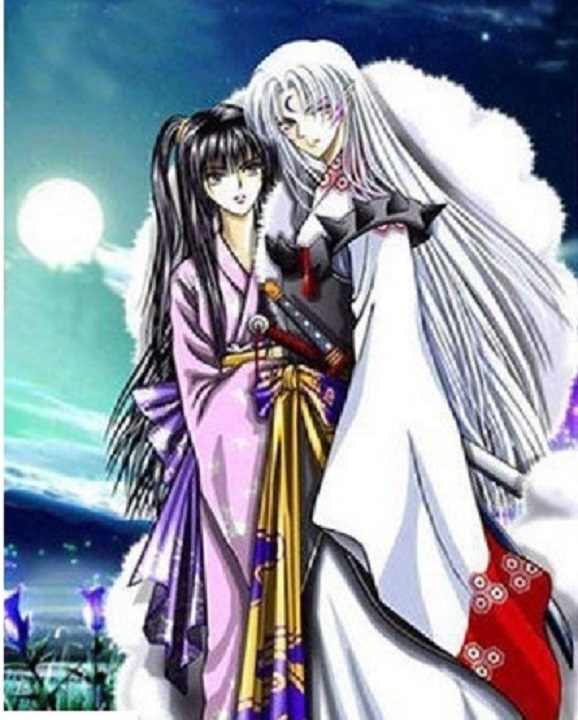 Zephra is speaking with her mother about their long travel back to the empire, Sango offers and suggests that they remain at her home for the night and resume travel back to the castle in the morning but Rin is sure that Lord Sesshomaru will be worried and wondering of their where abouts however even flying with Au Un the trip will be long and exhausting. Rin also decides that she would like to visit Granny Kaede before she leaves and decides they will remain at the human village for the night; she hopes that her husband will not worry too much knowing that her friends are here at the village. After speaking with her mother, Zepha returns outside to the girls at that time seeing they seem to have been in some sort of scuffle. One of Sango's daughters tells Zephra, "Zephra, a demon girl came and tried to steal the weapons my mother forged for you. We fought her off as best we could but her demon powers were too much for us, we were able to protect most of the weapons but I'm afraid she was able to obtain one of the weapons and she took off with it." Zephra asks, " Are either of you hurt?" They both respond in unison, "No my Lady." Zephra inquires, " have you girls ever seen this demon before?" One of Sango's daughters respond, "Oh yes My lady, she comes around, we know how to find her. This is not the first time we have had to fight her, she is always at the lake during daybreak when we go to fetch water for our mother, she gives a hard time every morning" Zephra responds, "Perfect, My mother and I will remain here until morning. At dawn, before she wakes...you girls will guide me to the lake and point out this demon, I will then retrieve the weapon and be back here before the sun rises." Early the next morning, before dawn...the three girls slowly and quietly get up and leave the hut. It is a bit dark however a dull light is forming indicating sunrise is slowly approaching. The two girls guide Zephra to the lake where they encouter the demon girl almost every morning in hopes that she will be there. When they reach the lake Zephra stays out of sight not wanting to alert the demon girl of her presence, she wants the demon to think that only Sango's daughters will be there. The girls walk up and there as always the demon girl is there collecting stones over by the lake. When she see's Sango's daughters approaching she says, "How many times do I have to fight you to keep you away from here? I've already told you this area is my turf, Humans!" One of Sango's daughters replies, "You took something from us and we're not leaving here until we get it back!," The demon girl replies back, "Oh you mean this fine weapon? It's mine now and I will obtain more of your possessions again and there's nothing you can do about it." The girls get themselves prepared to fight her when Zephra's voice stops them. As she walks up she speaks, "Girls, I asked you to guide me to this demon girl and you have. Your work is done, Now stand well back and observe. " The demon girl asks, "Who are you and what are they going to observe? You're nothing but a half demon, do you think you can take me on?" Zephra responds smiling with confidence but asking, "We will find out...won't we?" The girl instantly transforms into a true demon form of an eel and strikes at Zephra with bolts of electricity coming from her hands however Zephra does not seem phased by them as she uses her slash blades with impeccable speed blocking each strike that comes at her. Zephra growing bored of blocking the strikes and needing to speed things up, Jumps high and flips at such a fast speed that the demon girl was not able to see where she went and began looking from side to side to find Zephra whom is standing right behind her. Zephra then slashes at the demon girl using her claws causing the demon to yell out in pain as blood from the demon drips to the ground. The demon girl turns around attempting to attack Zephra again, this time using her sharp teeth, Zephra again avoids the strike with her fast movement but then strikes the demon girl with a hard kick to the chest causing the demon girl to fall back. With the demon lying on her back, Zephra stands above looking down at her and diplaying her claws as she say, "I'm in a hurry so shall I finish you off now with my poison darts or shall I take my weapon and leave you?" The demon girl changes back into human form and says "Take your weapons, I don't want any more trouble over this." A light flashes and catches Zephra's eye, she had not noticed before but the demon girl was wearing a bracelet that had little shiny diamonds all around it, pleasing to Zephra's eye she flashes a sinister smile and tells the demon girl, "remove that trinket from around your wrist and give it to me." The demon girl responds, "This is no trinket...it is a precious heirloom that was passed on to me from my great grand mother, it possess power you can not handle." Zephra responds with great joy, "Oh, that's good to know, now I really must have it...Take it off!" The demon girl reluctantly takes the peice of jewlery off and gives it to Zephra as she thinks: I don't want to fight this half demon again, she never even flinched from any of my attacks, she is too powerful. Zephra takes hold of the bracelet and gives the demon girl a warning, "Two things, first I advise you not to tell anyone about our fight or about your heirloom being taken, you will be wise to tell your family that it was lost and second, you know those human girls that come to the lake every morning to collect water, Well...if you mess with them, you will have to answer to me. Dont forget that. " Zephra begins to walk off with her weapon returned to her and a new shiny diamond bracelet as she tells the girls, "Let's get back quickly girls." One of Sango's daughters quickly catches up with Zephra while the other looks over at the demon lying there pitiful and in bad bloody shape informing the demon girl, "You had better heed the advice of my mistress or she will be back to finish you off." She then walks off following Zephra and her sister back to her mother's hut as the sun rises above the clouds. Sango makes a big breakfast for her family, inviting Rin and Zephra to join them. After breakfast Rin wants to pay Granny Kaede a little visit before heading back to the castle. When she arrives at Granny Kaede's hut she can tell that something is wrong, the huts entrance has been broken down and the hut has some damage. Rin is worried and she tells Zephra to remain where she is as she runs inside the hut. The inside of Lady Kaede's hut has been ransacked and many of her belongs seems to be missing, Rin can hardly believe what she's seeing as she yells out, "Granny Kaede, are you here, are you okay?" Rin runs to the other room where she used to sleep before she moved to the castle and there was Lady Kaede lying on the floor on her back with a huge bump to her head. Rin's heart stops when she sees Lady Kaede in such a condition and she runs to her side instantly, She feels for a pulse and there is one, to Rins great relief. Rin runs back outside and yells out to Zephra, "Go back to Lady Sango's and have them get a village doctor for Lady Kaede, she's hurt...Please Hurry Zephra!!!" Zephra does as her mother orders and she returns with Sango, Miroku, Inuyasha and the village doctor. The village doctor cares for Lady Kaede as Miroku and Inuyasha work on fixing the damage to Lady Kaede's hut. The village doctor diagnoses her condition, "She has a nasty bump on the head, it knocked her unconscience...She will be fine but right now she just needs some rest." Rin asks, "May we see her now?" 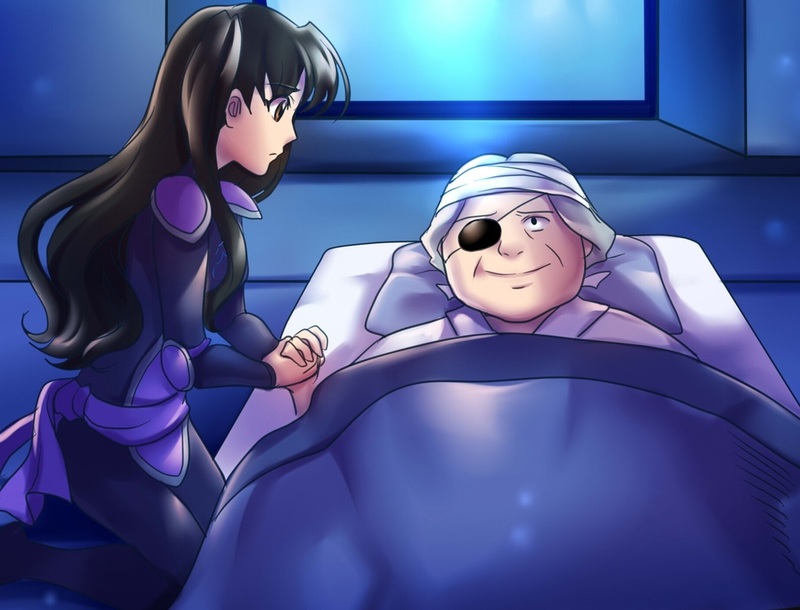 The village doctor allows Rin and Sango to enter the room to see Lady Kaede, she seems weak but is able to speak when she sees Rin and tries to sit up, "Rin, you're here." Rin quickly stops her, "No Granny, don't try to sit up..you just lie back and rest now." Rin sits close to Lady Kaede and holds her hand. Sango asks Lady Kaede, "What happened, do you remember anything? Kaede responds, "It was late last night, I was trying to tidy up before bed when two men rushed into the hut, they were asking for my valuables. I tried to tell them that I am a simple old woman, I have nothing of value. The moment I said that, one of them struck me hard with an object and that is the last thing I remember." Sango tells her, "It looks like they did get away with a bit of money, food and few other items." Rin then asks, " Granny, did you not see at all what they looked like?" Kaede tries to think and responds, "All I remember is that one of them had an fierce jagged scar on his right cheek and they both wore beards." Sango reminds Rin, "You'd better be getting back Rin, Sesshomaru will be worried. I will remain here with Lady Kaede for the night and she will stay with Miroku and I until this situation blows over." Rin responds in an unsure voice as she leans in close to Kaede, " I can't just leave like this." Kaede places a hand on Rin's cheek, "It's okay my sweet girl, now that I have seen you again, I am over joyed and my old self once more." Rin knows she must leave today, two days away from the castle and Lord Sesshomaru will surely show up here at the human village looking for her and Zephra; she does not want her husband burdened or worried due to their absence. Rin and Zephra begin their travel to the castle,they plan to fly but Rin has one more stop she wants to make, She wants to find these bandits that attacked Lady Kaede...They will die for what they have done and Rin feels no sympathy or mercy for evil bandits. Rin has never forgotten the brutal murder her family suffered at the hands of bandits and now her sweet Granny attacked, she cannot leave until she finds these bandits even if it means spending one more night at the village. Rin begins to ask around the village about a bandit that has a jagged scar on his right cheek and wears a beard; it turns out that Rin does not have to search or inquire much before someone gives her the information she seeks. Rin finds out the name of this bandit is Akuno, he is well known through out the northern human villages but lately he along with his comrade, has been pillaging the area of the West where lady Kaede's village is, she is also told where he normally spends most of his time when he is not terrorizing some human village. Rin is glad that she has come upon this information and so quickly, she plans to confront this thief and make it home to her castle before night fall, however it takes Rin longer to find him than it did for her to find the information, it is dusk when she locates the hideous man with the jagged scar on his right cheek. He and his follower are walking and talking when from behind they hear a woman's voice shout out, "AKUNO, TURN AROUND AND FACE ME NOW!!" Rin tells Zephra to remain on Au Un and out of the way as she unmounts Ah Un. The bandits turn around, Akuno asks, "What business do you have with me woman?" Rin informs him, "Last night you raided the hut of an old woman who is very dear to me so now you will pay with your life." Akuno and his friend both laugh at the thought of a mere woman thinking she has the ability to slay them. Rin continues to stand by waiting for him to approach, she is angry and never more serious about ending his life in fact her urge to kill him seems stronger than normal but she doesn't concern herself with this negative feeling and embraces it instead. Akuno pulls out his sword and runs to strike Rin as she swiftly jumps and half twirls as she kicks the sword out of his hand with ease, she then pulls out the hand yeilding weapon that was made for her daughters and slashes it with amazing speed and force making attack noises with each thrust. The bandit has a difficult time dodging her strikes and is unable to reach his sword, Rin wounds Akuno twice with the hand weapon when suddenly the other bandit jumps in realizing that Akuno is unable to handle her on his own as he thought. Using his sword he tries to strike at Rin and finds it difficult as she is blocking his strikes with the hand weapon and they constantly clash blades as all that is heard is metal on metal sound. Akuno gathers himself and gets a hold of his weapon and launches it at Rin as it flies in her direction, Zephra sitting near Au Un thinks she should block the sword from hitting her mother by using her slash blade but realizes that Rin has it under control...as the sword jets in Rins direction she quickly rams the hand weapon deep into the stomach of the bandit and shifts him in the direction of the flying sword, using him as her shield and making him the victim of that attack unstead of her. She removes her hand weapon from his stomach and the bandit falls to the ground moaning and groaning in pain before he dies. She walks toward Akuno and informs him, "You are next. " Akuno is not sure what to do as he slowly backs away but Rin walks directly up to him and slits his throat with the sharp hand blade, when she does that some of the blood from Akuno spurts out onto Rin's face and clothes. As Rin attempts to walk away, the smell of the blood is calling to her; she suddenly remembers the taste of Shehomachi's blood and craves it once more. Though she knows she can not consume any more demon blood, there is nothing stopping her from enjoying the taste of fresh human blood, especially human scum like bandits. She turns back to the bandits lying there with their blood oozing out and the closer she gets to it the stronger the smell and craving is for her. Rin rummages through the pockets and carry bags of the bandits and finds many items but she is able to make use of a bottle used to hold liquor, she cleans the bottle out as best she can and decides it will come in handy as a way to store their blood. Zephra, confused of her mother's actions watches on as her mother makes fresh slashes to the bandits body to obtain more and heavier blood flow to enter the bottle. Finally after collecting all the needed blood, Rin corks the alcohol bottle and places it in a bag with the weapons as she and Zephra fly with Au Un back to the castle making it there late in the night. Rin and Zephra finally return to the castle, Jaken greets them at the entrance asking, "Rin, Zephra...where have you been? Lord Sesshomaru has been waiting for you." Rin responds, "I will speak to him right away, Master Jaken." Rin kneels down and caresses Zephra's hair while instructing her to head up to her room for bed. She continues walking down the corridor of the castle and greets Sesshomaru at his throne, when he sees Rin he immediately stands up and walks to her and they embrace in a hug as he asks, "Rin, I expected you back last night." Rin responds quickly, "I know, I apologize Milord. It couldn't be helped...Lady Kaede, she was attacked and beat by bandits the very night we were to return. I couldn't leave her without ensuring her recovery." Sesshomaru notices the smell of blood, "Rin, there is something else. I can smell the blood of a man." Rin hesitates with providing her answer then reluctantly admits as she looks away, "I could never live with myself if I had just let them get away with hurting her. Now, I can rest well knowing that they will never hurt an innocent person again." Sesshomaru is not sure what to make of this, he knows that Rin holds bitter feelings for bandits but she is not prone to killing humans, He thinks to himself: Could this be a side effect of Shehomachi's blood or has her hatred for bandits reached it's limit? Rin informs Sesshomaru, "It's been a long trip, I'm going to bathe in the spring ,will you join me, Milord?" Sesshomaru informs that he will join her as Rin heads up to their room to obtain towels and their kimono robes so that they can bathe in the families private lake in back of the castle. After they bathe, Rin and Sesshomaru retire to the room for the night; he holds Rin close to him in bed as they fall asleep. After a few hours, Sesshomaru opens his eyes and notices that Rin is no longer wrapped in his arms nor is she in the bed with him. He sits up in bed, seeing from the window that the sun has not risen yet, he wonders where she could be. Sesshomaru gets out of bed and goes to his daughter's room to check on them and both Nephra and Zephra are sleeping peacefully. He leaves the girls room and begins to walk back to his room when the strong smell of human blood hits him again. Sesshomuaru decides to follow the smell of the blood and as he continues to walk he notices the smell becoming stronger as he comes close to Heroshya's room. He thinks to himself: Hmm, Heroshya is not at the castle tonight. What's going on? The door to Heroshya's room is slightly ajar providing him the opportunity to look inside the room, he finds Rin sitting there on Heroshya's bed and she is transferring blood from a bottle into several small viles. She corks the viles and sets them aside but she takes a swig from one of the small viles before putting the rest of them into a small carry bag. Sesshomaru is startled by what he is seeing, this is not his sweet Rin but he remembers Shehomachi's warning regarding a change in her demeanor. Sesshomaru enters the room making his presence known to her as he softly calls out, "Rin". Rin freezes when she hears Sesshomaru's voice and does not turn around to face him as she speaks, "Please My Lord, do not think of me as wicked. I will explain all to you in due time." Sesshomaru tells her, "It is unnecessary for you to explain, I am aware of what is happening...It is a side effect of the blood you drank belonging to Shehomachi." Rin raises her head and turns to look at Sesshomaru, her face showing an expression of surpise and relief in finding out the reason for the uncontrollable urges with in her. Sesshomaru continues, " Rin, you must use the power of your own will to return to normal. Otherwise your cravings will become stronger." Rin goes swiftly over to Sesshomaru and embraces him tightly, he caresses her hair as she informs her husband, "I can do that, I won't take another drop." The next morning, Zephra tells Nephra about the diamond bracelet that she obtained from the demon girl near Lady Sango's village. Zephra trusts her sister with this information as she must keep it secret from her mother and father. The girls go to the woods near the castle to play around with the bracelet attempting to unleash it's power but they are unable to figure out what the diamonds do. Zephra is in love with the way the diamonds shine and glisten on her wrist and can not resist the urge to wear it, she hopes that maybe her parents will not notice it. Nephra asks, "Maybe you shouldn't have taken it Zephra, What if the girl's family comes looking for her property back?" Zephra answers, "They won't, she doesn't even know who I am." Zephra wears the diamond and continues the normal activities around her family as usual, several days go by and no one notices the jewelry around her wrist. At night Zephra admires her trinket and fantasizes to herself about the types of magical abilities it may hold. When Rin comes to the girls room to tuck them in, she finally notices the bracelet on Zephra's wrist and asks her where it came from. Zephra tells her mother that she found it. Rin asks, "Where did you find it?" Zephra informs her, "At the lake near Lady Sango's hut." Rin still curious asks, "When did you go to the lake? I don't recall you leaving to go there." Zephra does not answer her because she has no explaination, Rin becomes suspicious and knowing that Zephra has a bit of bad streak in her she decides to probe more. She softly takes hold of Zephra's arms and asks, Zephra, did you take this bracelet away from someone?" Zephra answers, "Mother, does it really matter anymore?...it's done. I've been in possession of this trinket for many days now." Rin slightly tightens her grip on Zephra's arms as she scolds her, "Zephra, this makes you no more than a thief, where would you pick up such habits? Your behavior could hurt the reputation of your father's empire." Zephra responds, "Mother, the demon I took this bracelet from is nothing more than a thieving brat herself. I stole from the very one who stole from me, we would have never encountered each other had she not stolen one of the weapons we had forged." Rin is so disappointed by her daughter's actions she says, "I don't care Zephra, You shouldn't lower yourself to her level by mimicking her behavior,we are going to take that bracelet back to the lake for her to retrieve it, it's not yours to keep." Zephra having no intention of returning the bracelet plays a trump card against her mother, "Very well Mother, Shall we return the blood that you took from those bandits you killed also?" Rin's eye's raise in shock, she'd forgotten that Zephra was with her when she bottled the blood. Zephra continues, "I suppose we can not return it now can we, you've been drinking viles of it every day even though you told father you would not." Rin can not believe how much information Zephra has and how she is using it against her. Zephra gives her final word on the subject, "Mother, just remember that you killed to get what you wanted; the girl I took this bracelet from is at least still alive." Rin is speechless and silent for a moment. She decides to drop the subject, resuming her original task of tucking Zephra and Nephra in as she says, "Good night girls, sleep well." she walks out and leaves the room. Nephra who was lying in her bed the whole time sits up and looks over at Zephra quietly saying, "You shouldn't have said those things to mother Zephra, I think you hurt her feelings." Zephra tells Nephra in a quiet voice, " I know, I didn't want to upset her but what else could I do...I'm not giving this bracelet back. I will make it up to her and bring her flowers tomorrow." Zephra turns to her side to sleep. Rin has continued to drink viles of blood from the bandit she killed, going back on her word to avoid drinking any. She finds the urge for blood too overwhelming for her to control especially with viles of blood in the castle. When Rin goes to drink one of the blood viles she realizes that she is down to the last one and she tells herself that this will be it, no more blood. She tries to be a normal mother and wife by making clothes; cooking meals for her daughters and assisting her husband with affairs of the empire when she can in the hopes that a busy life will keep her mind off of her unusual problem. Her plan seems to work but at night it is extremely difficult for her to cope with her craving and each night she has intense sweats combined with chills, stomach pains and headaches. Some nights Sesshomaru is not around to see the pain that his wife is going through but other nights he witnesses her ailments and feels irritation at the fact that there is nothing he can do to help her often wondering if providing her with the blood of a demon was actually a wise decision after all. Sesshomaru does not realize that Rin has continued to drink more blood since the last time he saw her filling the viles, so he is confused as to why she is still having pain and negative reactions from not ingesting blood and he worries that she will never be able to live without supplying herself with blood everyday however at the same time Sesshomaru remembers that the demon Shehomachi clearly said that if Rin uses the strength of her own will power, she will be able to overcome the changes she is experiencing so he thinks that if they are patient things will return to normal. It's been five nights since Rin drank her last vile of blood and she is not looking forward to another sleepless, uncomfortable night, she tells Sesshomaru that she is going to sit outside the castle and enjoy the scenery of the night sky instead of going to bed. Sesshomaru has a strange feeling that he should sit with her and remain at her side but he dismisses it thinking that he may be acting unnecessarily paranoid. Many hours passing it is soon to be morning but the sun has not risen, Sesshomaru lying in bed opens his eyes and looks next to him and his wife has still not joined him in bed, her side of the bed looks to be undisturbed. He thinks to himself: No way is she still sitting outside, I must find her. Looking all around the castle he does not have any luck in finding her, realizing she is no longer in the castle nor is she outside of the castle. Sesshomaru talks to the demon guards outside of his castle asking, "Where is Rin, she would have passed through here." The guard responds, "My lord, she left with Au Un some time ago. She did not say when she would be returning however she wore battle gear, her weapons and a nap sack, Milord." Sesshomaru does not speak, only looks out into the night wondering to himself what is happening to his wife. When Rin returns it is still dark, Sesshomaru is sitting at his throne waiting for her entrance. Rin is startled to see him as she had hoped that she would have been able to easily slip in and out of the castle unbeknownst to her family. The moment she sees her husband is waiting she stops in her tracks and says, "Milord, the sun has not yet risen, you should be resting." Sesshomaru responds softly, "I should say the same to you, where have you been?" Rin quickly replies, "I...I felt restless and I went to our forest to test out the weapons I had forged for the girls." Sesshomaru thinks to himself: This is not good, In all of the years I have known Rin, she has never lied to me and she normally never would. This is very unlike her. He continues on indulging her pretense, "In this late of night?" Rin responds, "Well, as I said I couldn't sleep and thought I would get a bit of exercise but now wild horses will not keep me from sleep. I think I will retire now, at least for a few hours before the girls wake up." Sesshomaru tells her, "Very well Rin, if you are tired you should rest...however I must insist you leave your nap sack and weapons with me." Rin looks at Sesshomaru unsure what to say or do next as she thinks to herself: He knows I have blood in this nap sack, of course he can smell it with his keen sense of smell...how could I have forgotten that? He knows I have been lying about where I've been, what must he think of me? Rin being overly consumed by her cravings for blood acts completely out of character and says, "I am sorry Milord. No, I will not." Sesshomaru is shocked, again she has never denied a request from Lord Sesshomaru in all of her years with him. Sesshomaru stands up and with a raised voice he says, "What was that Rin?!" Rin responds, "Milord, please do not ask me to hand over my nap sack. I have never disobeyed you but I can not submit to your request." Sesshomaru walks up to Rin as she tries to back away from him securing her nap sack close to her. He looks at Rin clutching the nap sack close to her and says, "You will not hand the nap sack over to me? Then I will go to the human village to seek Kohaku and I will kill him." Rin can not believe what she is hearing and she responds," Kohaku, what does he have to do with any of this?" Sesshomaru explains, " I would have killed him before when he attacked you and our then unborn twins, however, I held back. I held back for you Rin, because you asked me to. It seems we are no longer honoring each other's requests, therefore I will return to my original coarse of action and kill him." He turns to walk away to retrieve his swords intent to carry on the task of killing Kohaku when she stops him, "Wait, what do you want with my nap sack." Sesshomaru tells her, "I want to observe it's contents." Rin still unsure of his intentions, "You already know what it contains, don't you?" He holds out his hand and Rin reluctantly submits her nap sack to him. Sesshomaru opens the nap sack and removes the medium sized bottle that contains blood throwing it across the room smashing it into pieces causing the blood to splash to the floor. When Rin sees the blood splash to the floor she feels frustration thinking about all she had to go through to obtain it and the nights she will have to endure symptoms without it. She groans softly as she begins to run over to the spilled blood in the attempt to scoop up what she can but Sesshomaru quickly grabs her arm stopping her from going any further ; asking, "Who did you have to kill in order to retrieve this blood for yourself Rin?" Rin angrily answers, "Nothing more than bandit scum during one of their village night raids." Sesshomaru thinks to himself: I will not let this obsession take you away from me Rin. He says out loud to her, "You will obey me." He then lifts Rin over his shoulder and carries her up to their room continuing to speak, " You will not consume any more blood from this day forth." Sesshomaru decides he will watch Rin from here on, He will remain at her side, ensuring she does not leave to get more blood. Zephra loves her beautiful new bracelet though she admires it everyday she still can not stop wondering about the power it possesses. The demon girl who was an eel demon said that it possess some power but what? Every day for many days Zephra has tried to bring the power out...she shakes it, tosses it, flings it, speaks to it but nothing works. Neprha and Zephra are outside, Nephra feeds Ah Un as Zephra plays around with the bracelet more and becomes frustrated as she speaks to Nephra, "You know, I bet this jewel has no power at all. That pathetic demon most likely just wanted to make herself seem more powerful than what she is." Nephra responds, " It was foolish of her to tell you that, she had to know that you would want to possess a powerful trinket for yourself." Zephra insists, "No, she was lying...Oh just wait til I see her again!" Zephra punches her fist into the palm of her hand indicating a beat down for this demon when just then an extreme surge of lightning races through the palm of her hand. Zephra yelps, "Owww" as she swings her hand up and shakes it. Nephra asks, "What just happened Zehpra? Are you okay?" Zephra also confused answers, " I don't know, I just felt a horrible shock to my hand. It really hurt and..." Zephra stops in mid sentence thinking: It was the bracelet? Zephra wants to test it again but she does not want to feel that surge of pain go through her again so she tells Nephra, "Stay well back and out of the way Nephra, I want to try something." Nephra steps aside with Au Un and gives Zephra some room. Zephra punches in front of her although no one is there, when she does this... a strike of powerful current bursts and flies out straight ahead of her. She punches in front of her again at no one but this time using more force in her punch, a lightning strike flies out again this time stronger making a loud "CLAP" and "BOOM" sound as it hits a tree that was a distance in front of Zephra causing the tree to fall to the ground. Zephra is absolutely elated and delighted with this power she has just discovered, "Ha Ha...I've got it, That's it Nephra, That's the power of my bracelet." Nephra responds, "Amazing. No one is more better suited for it than you. One thing I don't understand though, if the demon girl that originally owned the bracelet was an eel demon, she already has the power of electricity within her, why would she need that bracelet." Zephra thinks she knows the answer, "She doesn't need it, It was an heirloom. I think that all the demons in her family have worn this bracelet for years passing it down from generation to generation each time more demonic energy being passed to it. She was only wearing it to keep with tradition, however it will prove to be extremely useful to me." Nephra brings one thing to Zephra's attention, "Keep in mind, I don't believe you will be able to use that bracelet when in your human state Zephra. Your demonic energy may be needed to bring the power out." Zephra agrees, "I think you might be right...Urrr, Blast that night we turn full human!! It's such a bother. " For several days Sesshomaru keeps a close eye on Rin never allowing her to be alone. However he is unable to remain with her at all times. Due to the affairs of his empire, Sesshomaru will sometimes leave gaurds to follow Rin's every movement to ensure she does not leave the castle alone for any reason. Rin prepares herself to bathe in the hot spring outside, she finds it soothing, relaxing and very enjoyable. Sesshomaru is aware that bathing in the hot spring is one of Rin's favorite things to do but he can not risk her being left alone in fear she will run off again. As Rin steps out of the sleeping quarters with her towel and wearing her bathing Kimono, she sees the two demons gaurding the door as one of them asks, "Is there something we can get you My Lady?" Rin responds, "No Thank you, I'm only going to bathe in the hot spring outside, I will return shortly." The demon guard informs her, " I do apologize Milady but the master has ordered that you are not to bathe in the hot spring until his return at day's end." Rin responds, "Oh,I see...Then I shall do as Lord Sesshomaru orders." The guard then asks, "May we have your lunch sent up My Lady? Or perhaps we can accompany you to a walk through the forest if you are in need of fresh air?" Rin thanks the demons again, "Thank you but no, I am fine." Rin retreats back into the sleeping quarters and boredly stares out the window as she thinks to herself: Hmm, so he doesn't trust me now. I guess I've given him every reason not to. Rin continuing to stare out the window looks down and can see the grass and ground below, it is a long way down but for a moment, desperate for blood to drink and wanting freedom from the guards , thinks she may be able to climb down but dismisses the idea as she thinks: there are guards all over this place, I'm sure he has alerted them all to keep a look out. She lies down on the bed and continues to thinks to herself: Anyway, I've got to try harder to overcome this addiction, we can't live like this forever. Lord Sesshomaru shouldn't have to waste his time watching over me like I was a helpless little girl again. I won't be a burden to him, I love him so much and I don't want to lose him. After some time Jaken returns to the castle with Nephra and Zephra, they go to the sleeping quarters to visit Rin. She hugs her little girls asking them, "How was your sparing session." Zephra tells her, "It was great, I love sparing." Nephra responds, "It was fine mother, now Zephra promised me she would pick berries with me." Zephra assures Nephra, "Okay Okay, I said I will and I will." Nephra asks her mother, "Mother, after we pick berries...will you bake us a pie? Rin responds, "Of course Nephra." Jaken chimes in, "Oh Whoo Whoo, I sure love those pies Rin. I can hardly wait." Nephra excited also says, "Let's get going, the faster we get the berries the faster we can enjoy pie." Nephra and Zephra dash out of the room as Jaken starts to follow behind them. Rin still very bored and lonely asks, "Master Jaken, let me come with you all. I can't stand this any longer, I feel like a prisoner." Jaken responds, "Oh no you don't Rin, Lord Sesshomaru doesn't trust you and I don't either. The minute my back is turned you'll run off and Lord Sesshomaru will have my head. If he is punishing YOU like this, I cringe to think what he'll do to ME if I disobey his orders." Jaken shakes with fear just thinking about it, "If you want to go out with us, you'll just have to let the gaurds accompany you." Jaken hurries out of the room shouting, " Hey you girls wait for me!!!" Rin plops down on the bed disappointed as she says out loud to herself, "Stupid Master Jaken, I wasn't going to run away." When Sesshomaru returns, his daughters are enjoying a bath, splashing around in the hot spring out back while Rin is baking a pie for them with the berries they brought. There are two demon gaurds at the entrance of the dining quarter watching Rin's every move. Sesshomaru dismisses the gaurds for the evening taking over the task of looking after Rin. Sesshomaru tells her, "Rin, I understand that it must cause you great discomfort to have demon gaurds following you around through out the day, therefore, you are free to roam as you so please." Rin is extremely happy to hear that she has her freedom and privacy back but she asks her husband, "My Lord, I have caused so much trouble. Do you trust me again?" Sesshomaru responds, "No, It is obvious you will kill again and continue to collect blood but there is nothing I can do to stop it. This is a problem only you can resolve Rin. Locking you away in the castle will not remedy it either. " Sesshomaru walks out of the dining quarters and to his throne. Rin does not realize that Sesshomaru has another little trick to help Rin strengthen her will power. He is hopeful that it will work but if it does not, he is willing to accept that Rin will forever feed on human blood however, as long as it doesn't harm her and she is taking the blood from bandits, Sesshomaru is not really too concerned. Having much time on her hands Rin makes a big dinner for her family instead of having the servants do it; after dinner.... she,the girls and Jaken enjoy the berry pie. Rin is in such good spirits having the freedom to move about the castle as normal, that she decides to go and enjoy the hot spring out side. Afterwards she goes to the sleeping quarters where her husband is already resting. She softly kisses and makes love to her husband as she tells him how much she loves him and that she will never be untruthful to him ever again... while at the same time thinking how lucky she is to be married to ' The Great Lord Sesshomaru.' She thinks to herself that she never wants to worry or anger him again but when the sun rises and Sesshomaru awakes he yet again finds Rin gone. Her scent is still fresh in the room so he knows she must have just left, He springs into action and collects their daughter Nephra, having her hold on to him as they fly to the nearest area that bandits are known to gather. Sesshomaru is fast getting to Rin and spots her quickly, He and Nephra quietly swoop down landing on the side of Rin who has a bandit on the ground ready to strike him dead. Sesshomaru allows Nephra to watch as Rin is raising her weapon to strike the bandit. She can clearly see Nephra standing with Sesshomaru as she turns her attention back to the bandit she declares, "Please Milord, do not let our daughter see." Sesshomaru responds, "She will see and afterwards, you will explain your actions to her." Nephra having a kind heart like her mother asks, "Mother, are you going to kill this man? Why?" Rin responds, "He has killed many innocent human beings Nephra...he does not deserve to live." Nephra reminds her mother of what she told Zephra, "But I thought you said we should not lower ourselves to their level, we should not mimic their bad behavior." Rin has a strong grip on her weapon and holds it there at the neck of the bandit for a moment, she finally stands up and tells the bandit, "Be gone, I have no use for you." The bandit nearly losing his life happily obliges and swiftly runs off. Rin goes over to Nephra and hugs her saying, "You are right, we are a strong and powerful family but our actions are never evil. Let's go home." Rin suddenly finds it much easier to resist her craving for blood and her symptoms are weaker with each passing day. She wants her daughters to realize they are strong and can overcome anything, Rin knows she has to practice living by the same lessons that she teaches to her daughters and not be hypocritical of her own words; also she does not want her daughters to see her as a blood thirsty murderous killer. Sesshomaru knew that Rin would feel this way and he knew that Nephra was the perfect one to help her see the wrong in what she was doing. With in months, there are no more instances of Rin disappearing in the night or in the morning and as the years pass, she no longer has any craving or desire for human blood.